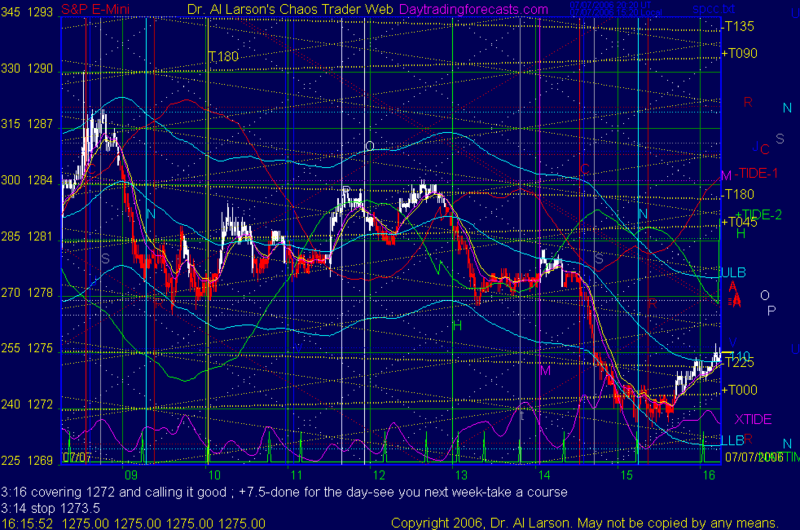 7/7/2006 11:53:10 AM Mountain Balanced:: And taking 1 to 3 trades per day. 1 to 2 usually for me and of course I consider a flip to be the same trade. Thank you for your being in the market as it is very true. 7/7/2006 11:49:44 AM Mountain Balanced:: No problem. I do not want to confuse. Your system is most admirable and you have shown me the true meaning of momentum. 7/7/2006 11:43:28 AM Mountain Balanced:: Not sure about the moon tides but the momentum trading with the EMA's are what I have learned most from your information and I think I have been a great example of that today. Is it not what is happening real time? I do not want to confuse anyone just get them pointed in the right direction. If you would not like me to post on Fridays or anytime for that matter. No problem. 7/7/2006 11:28:32 AM Mountain Balanced:: Today flying like an eagle who just had a pleasant meal. 7/7/2006 11:26:11 AM Mountain Balanced:: Out at 78.75 on most last few at 77.75 and should get some bounce here for a quick flip if want to counter. Plus 1.5, 3 and 5. Still looking for 6 points on remainder. 7/7/2006 11:19:43 AM Mountain Balanced:: Parked at 77.75 on most. 7/7/2006 11:14:29 AM Mountain Balanced:: Filled on the 79.75. Still 40% left. How about 5 points htis time? 7/7/2006 11:10:42 AM Mountain Balanced:: Some parked at 79.75. 7/7/2006 11:06:49 AM Mountain Balanced:: Stop at 83. 7/7/2006 11:04:35 AM Mountain Balanced:: I feel better with the background in favor. Momentum should be better and possible 5 points to the down side should be easier imho. 7/7/2006 11:03:24 AM Mountain Balanced:: Took some off at 81.25. 7/7/2006 10:59:08 AM Mountain Balanced:: Looks like she is going to brek down I have flipped at 82.75 and am short now. Stop at 84. 7/7/2006 10:52:23 AM Mountain Balanced:: Stay in this long. Looking better. But if it breaks to 82 I am out. 7/7/2006 10:39:52 AM Mountain Balanced:: If we break this time we should get that 5 pointer or more. 7/7/2006 10:36:25 AM Mountain Balanced:: Took some off at 83.75. Forgot to move stop from 80.5 to 81 and did not get hit so still riding momentum stop at 80.5 still. 7/7/2006 10:30:33 AM Mountain Balanced:: Still in long. Added on at 82.75. 7/7/2006 9:48:18 AM Mountain Balanced:: This flip looks good. Took most off at 83.75. So minus 1. Then plus 1.5, 2 and 2.5. Looking for 4 to 5 points or more on remaining load. Stop 81. 7/7/2006 9:44:53 AM Mountain Balanced:: Stop at 80.5. 7/7/2006 9:42:26 AM Mountain Balanced:: Took some off at 82.75 but still more in this. 7/7/2006 9:36:33 AM Mountain Balanced:: Ii expect them to run these to the upside now with that last bottoming action. Lets see. Stop at 79. 7/7/2006 9:35:41 AM Mountain Balanced:: Missed the exit at 79.25 and flipped it at 81.25. Now long. 7/7/2006 9:28:38 AM Mountain Balanced:: Taking the short at 80.25. Stop at 82.25. Going with background and EMA. This is not the best of set ups. 7/7/2006 9:18:36 AM Mountain Balanced:: Good friday. Lets make some money today! Today I will give a solid winner from a relaxed and centered place in the Universe.